This year at Dwell on Design Los Angeles, the Dwell Store assembled an assortment of products for the modern home and lifestyle, including designs that launched at Dwell on Design 2015. Get a behind the scenes look at the event and explore the best-selling products. View the complete pop-up collection at the Dwell Store. Designer Eric Trine’s Octahedron and Double Octahedron Planters were created with a special hammertone finish, making them an exclusive design for the Dwell Store. The planters elevate the look of a standard terracotta plant by adding color, geometry, and lifting the pot up from the floor. 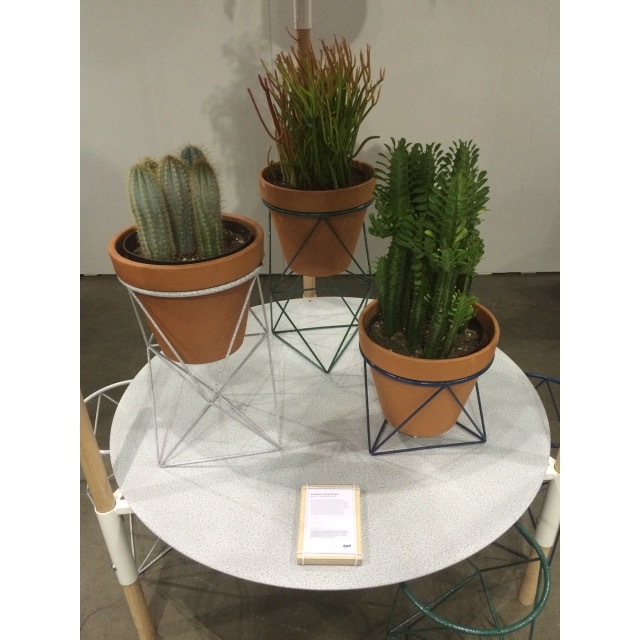 This item launched at Dwell on Design and is available for preorder at the Dwell Store. The Microgreens Indoor Garden Kit is a foldable, indoor greenhouse made by Infarm with partner Tomorrow Machine. Inspired by origami, the kit folds into a miniature greenhouse that is made of a transparent, waterproof material. The innovative product allows users to grow nutrient-rich greens in a kitchen, living room, or any interior space. With a small profile, it brings gardening into even the smallest apartments or homes. This item launched at Dwell on Design and is available for preorder at the Dwell Store. This daybed and lounge chair was originally designed in 1962 by Ole Gjerløv-Khudsen for his son, who was embarking on a camping trip. Comprised of a sustainably harvested soaped beech frame and natural jute, the Portable Daybed and Lounge Chair are easily transported and can be used in indoor and outdoor spaces. This photo shows the easy assembly for the daybed, which requires no tools or hardware. A show-stopper at this year’s Dwell on Design, the Iconic Architecture Card Game is a set of cards that features the greatest modern architectural icons separated into seven groups including events, house, tower, culture, religion, housing, and museum. Including 44 black and white cards, the game spans architecture all over the world that have been carefully selected because of their diversity, architectural aspects, technical details, and cultural value. Designed by Monica Förster, the Brushed Brass Flower Pots celebrate the shape of traditional terracotta pots and elevates the look with a luxurious material selection. Maintaining the historical production methods of the Skultuna factory, these flower pots are made through the traditional practice of metal spinning. Photo: Dwell on Design 2015, shown with Tokyo Elevations Print and Brooklyn Landmarks Print from studio esinam and Forma Sculptural Candle Set from Bower. These simple key rings from Areaware were a favorite personal accessory at Dwell on Design. Available in two shapes—Bend and Drop—The Contour Key Rings recall the look of retro, oversized key rings, with a modern slant. Crafted from 10-gauge brass wire, these key rings close and secure with a simple screw clasp. A favorite for coffee-lovers at Dwell on Design, the Bruer Cold Brew Coffee Maker is an innovative kitchen product that allows people to brew cold brew coffee in their own homes. Cold brew coffee is a smooth coffee that is less acidic and bitter than hot brewed coffee. The process extracts different compounds from the coffee, giving it a different flavor than hot or iced coffee. The Mesh Notebook from HAY takes a simple desk accessory and gives it a design upgrade. The flexible cardboard cover of the notebook has been perforated, alluding to the look of mesh fabrics. Available in four soothing colors, each notebook in the series includes an elastic band that can be used to secure loose items within the notebook, and it can also be used as a bookmark. One of the biggest attractions at Dwell on Design, this solid wood shuffleboard table from Chandra brings pub-style entertainment into the comfort of home. The handcrafted table is comprised of ash wood that is assembled and hand-stained in Atlanta. The table features a leather gutter and a thick 1.5-inch solid hardwood butcher block playing surface that is finger-jointed and finished in a smooth, glossy polyurethane. This coating not only provides durability for the board, but also ensures that the pucks will slide true.